Open evenings are a great way to explore your postgraduate study options. They have been specifically designed to give you the opportunity to interact with academic staff and current students to ask all of the questions you may have about our master’s programmes or research degrees. Throughout the event, you will be able to receive a tour of our campus and hear from academic staff from each Institute, who will be able to share knowledge and advice about any aspect of our programmes, teaching, research and facilities. 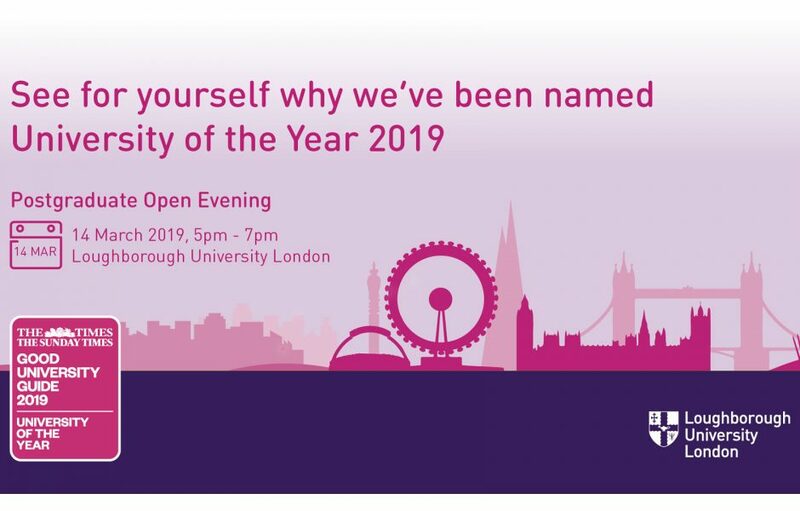 We will also have stalls from a wide range of departments, including postgraduate admissions, careers and employability, student support, accommodation provider Unite Stratford One and LSU London. The event will be held on the ground floor of our campus, which is located at Here East on Queen Elizabeth Olympic Park. For advice on how to reach our campus from wherever you are, please visit our how to find us page. Student ambassadors will also be on hand to direct you from Stratford International Station and the bus stop at Here East – look our for a friendly student ambassador in a purple Loughborough top/coat. For more information and how to book a place, please see our events page.